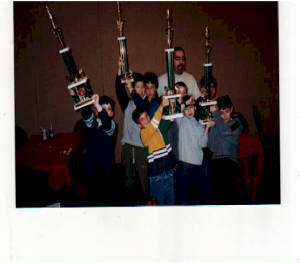 from the Hoboken Chess Academy plays legendary blitz champion Russian Paul. 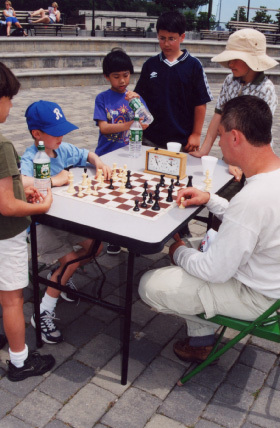 Paul is in the movie Serching for Bobby Fisher and is the top player from the famous Washington square park. Looking on right to left; James Arsenault, William Alston, unknown child, and Liudmil Liudmilov. 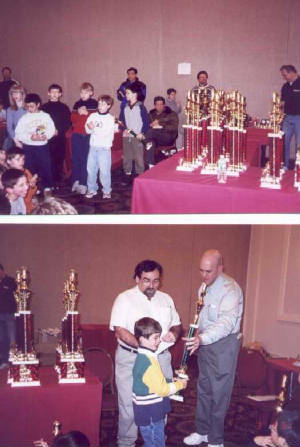 Beck, Alston, Arsenault and Liudmilov's combined remarkable State Chess championships record are 45 wins and 2 draws, and omly 8 loses in 4 years!. placing in the top 4 each year. Alston has won the top spot once and placed second another time. Beck has won top spot in his grade 3 times. Arsenault has played board 1 for the championship 4 consecutive years.